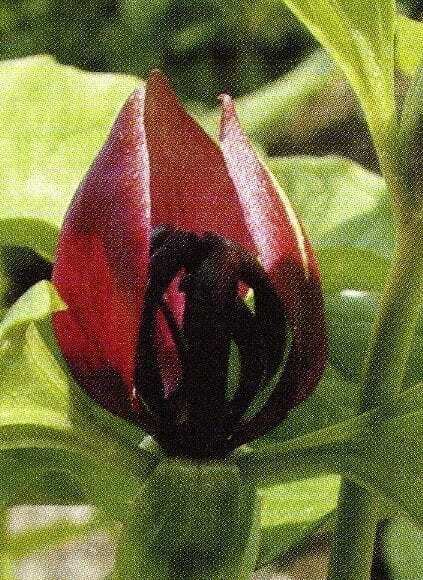 Trillium recurvatum is slightly taller than other Trillium species with very dark maroon flowers, held erect above the foliage. The sepals are recurved, hence the name and the foliage is bright green and variably marked. This Trillium is happy in a heavy, moist soil and is long lived but often takes a year to settle before flowering. All our trilliums are flowering sized tubers and are sent with a care sheet. Organically grown in peat free compost. The wood lilies need good leafy soil, in part shade conditions, under deciduous trees or shrubs. They are from North America and usually very hardy but can be prone to slug and snail damage as they emerge in late spring. They can be propagated from seed or careful division of the tuberlets.